Frequently, the thing that is at hand can help you the most. This rule happens to be true in case of hair oiling. Not only the expensive oils has to be the one to have great impact on hair. Maize oil has amazing nourishing, elasticity restoring properties, but also calms irritations and improves blood circulation in skin. How does it work on hair? It is obtained in the cold pressing process of maize shoots. These are separated from the grain in the milling process. Maize oil has intense orange colour. Its refined (purified) version is much lighter. However, in hair care better is to use unrefined maize oil, because it holds the most nourishing substances. What does maize oil contain? In most part, maize oil is made of EFA, i.e. essential fatty acids. It contains even 70% of linoleic acid and a bit less, oleic acid. On top of it, maize oil is rich in phytosterols, vitamin K and vitamin E, which is believed to be the most effective rejuvenating substance. When taking into consideration the amount of fatty acids omega-6 and similar amount of omega-3, it can be used for two hair types. Maize oil is particularly recommended for high porosity hair. However, its action will be great also on medium porosity hair prone to worsening of its condition. It is suitable for dry, damaged, weak and problematic hair. Most of all, maize oil effectively nourishes devoid of essential nourishing substances cells. It improves micro circulation, which contributes to health improvement, but also has impact on the appearance. This oil calms all sorts of irritations thanks to acid balance, prevents water loss. What is its action on hair? 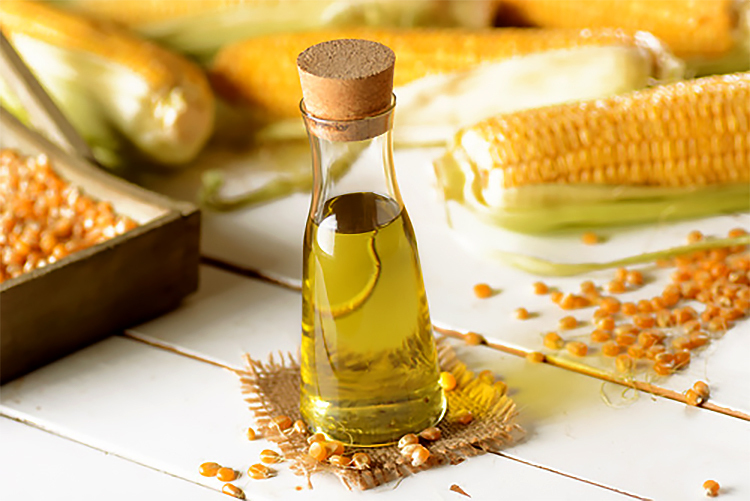 Maize oil can be easily used for hair oil treatment. It makes calcium absorption easier and as a result it prevents excess hair loss. Improves blood circulation in scalp and this is beneficial to growth of healthy and strong hair. Maize oil makes hair grow faster, stronger and makes sure that hair fall out less. Besides, hair oiling with its help provides radiant gloss and smoother, easier combing and inhibits ageing processes in cells.